"Proactive interference" (Wickens, 1973) is jargon for the way in which it gets more and more difficult to remember sets of the same type of stimuli, since previously remembered sets interfere or confuse. "Release from proactive interference" (Wickens, 1973) describes the way in which after a series of similar memory tests one is given a novel set of items to remember, then ones short term memory returns almost to fresh, first test or second test levels, since the novel stimuli are not confused or "interfered with" by the previous tests sets. "Release from proactive interference" between visual and audio modalities, mentioned previously, is only found, in Western subjects, when moving from audio to visual stimuli and not when moving from visual to audio stimuli (Hopkins, Edwards, Tamayo, Holman, & Cook, 1973). In other words, if Western subjects are given three memory tests with three pictures of fruit followed by a memory test using fruit words, their performance does not return to previous levels. But if Western subjects are given three tests using fruit words, and an a fourth with pictures of fruit their performance does improve to previous levels. The reason for this asymmetry may be due to the fact that, even when shown pictures of fruit, Western subjects are likely to think, or hear themselves speak (Derrida), the words for the fruit, so that their short term memory of fruit words is being depleted ('proactively interfered' with) even in the visual pre-test condition. In the case where Western subjects are first given fruit word memory tests however, the Western subjects may not generally imagine the fruit corresponding to the fruit words, so if on the fourth trial they are shown fruit images, these images are felt to be novel stimuli, that are not "proactively interfered" with by the previous verbal trials. I predict that Japanese may show the reverse pattern in that moving from audio fruit words to visual fruit pictures may not result in a "release from proactive interference" since in the audio condition Japanese may imagine the fruit that is presented in words. However in the visual pretest condition, the Japanese may not bother to say the words for the fruit to themselves (see Kim, 2002 for evidence), so if the fourth trial is of fruit words, then they may show a release from proactive interference -- an improvement in recall -- since the fruit words will be felt to be novel stimuli. This would be easier to test than self-related stimuli. The test response method (getting subjects to say or draw the fruit) and distractor task between trials (getting subjects to add visually and verbal presented digits) may also confound results. Interestingly a mixed audio and visual filler task (adding visually presented digits) produced the same results as an audio tasks adding orally presented digits. Again, I think that this is because Western subjects would be likely to self-speak the images of digits, so images are always mixed mode for Westerners. Following the reasoning in Kim (2002) the same may not be the case in Japan. According to a Nacalian transformation, a mixed filler task would be equivalent to a visual filler task since Japanese will provide the visuals when presented with oral stimuli. Oral stimuli are likely to be always mixed mode for Japanese. I wonder if there is pre-existing Japanese research on this paradigm, and whether a reversal has already been found. Or whether the same tendency was found. No this paper (Hopkins, Edwards, Tamayo, Holman, & Cook, 1973) seems to be cited only three times, and only by researchers in the West. Searching for the authors surnames and Japanese keywords likewise yields no hits. There is some Japanese research by Tadashi Fujita (Fujita, 1995; 藤田正, 1985, 1988) and the results are not good from the point of view of my hypotheses. 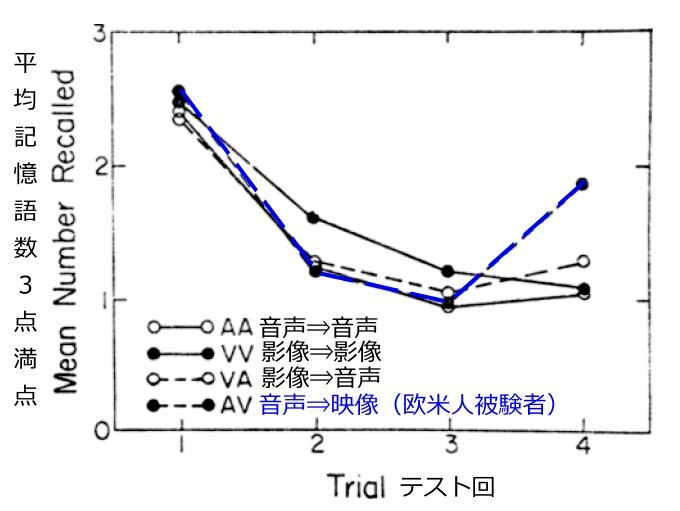 In the main the research I have found is not testing audio visual modality shifts and repression of proactive inhibition but in the one article which did investigate modality (Fujita, 1995), to a degree, by looking at the way in which kanji characters interfere with each other, it was found that similar kanji pronunciations do result in proactive interference (suggesting that Japanese do not process kanji by image alone, as is well known) whereas different pronunciations result in a release from proactive inhibition. And even worse for my hypothesis, changing the radical of kanji did not however result in a release from proactive interference, whereas semantic differences between tests did. This suggests, contra my hypotheses, that Japanese are thinking in phonemes and semantics (meaning) more than purely in kanji morphology. In a more recent paper (Fujita, 2007) it was found that Japanese (kun) reading of the kanji has more effect than the Chinese (on) reading. I would be more interested to know what happens when Japanese remember non linguistic images or icons, other than kanji. Fujita's research used a different methodology, with successive tests being in the same or different groupings rather than three tests in the same followed by one in a different group. Hopkins, R. H., Edwards, R. E., Tamayo, F. M. V., Holman, M. A., & Cook, C. L. (1973). Presentation modality and proactive interference in short-term retention using a mixed-morality distractor task. Memory & Cognition, 1(4), 439–442. Kim, H. (2002). We talk, therefore we think? A cultural analysis of the effect of talking on thinking. Journal of Personality and Social Psychology.